Windows Small Business Server (SBS) is an integrated server suite from Microsoft designed for running network infrastructure of small and medium enterprises. While Microsoft has always championed the small business with its line of Small Business Server (SBS) products, the company’s most strident server advances in recent years have been with high-end enterprise products, and not those that serve smaller companies. That’s all changing with Windows Small Business Server, a product suite that improves on the simplicity and ease-of-use features from previous SBS versions, and adds a host of new functionality. Why there is “Low Disk Space” warning? Sometimes, you may just need to ignore or disable your Windows low disk space in SBS Server. But it is not so simple when the problem is on the C: drive. In order for your computer system to operate properly it needs a minimum amount of available disk space on the system drive. The 200 MB threshold is the line that Windows has drawn for optimal performance. Once you fall below this threshold your system automatically takes actions to maintain minimum performance capabilities. When your available disk space falls under 80 MB, Windows SBS Server delivers a stronger warning message, and then it starts to free up drive space by deleting previous System Restore points. This reduces the number of restore points you can select to restore your computer if the hard drive is impaired or corrupted. To extend SBS server partition is a good way to solve such kind of “Low disk space”. 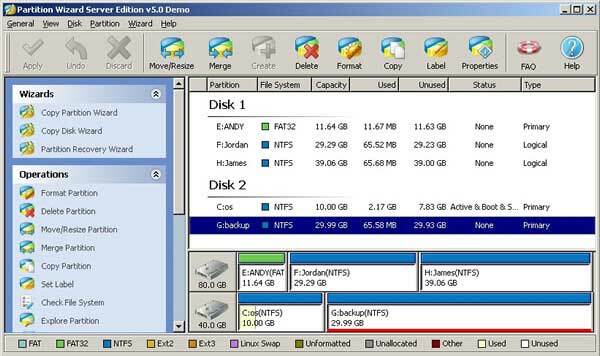 Partition Wizard Server, a powerful server partition software, performs both basic and advanced partition operations on your servers without data loss, including: Resize and Move partitions, Copy Partition, Copy Disk, Create and Delete partitions, Format partitions, Convert partitions, Explore partitions, Hide and Unhide partitions, set active partition, etc. Changes of SBS server partition can be previewed before applying to hard disk. You may wonder how to extend SBS server partition with this program. Well, this operation can be perfectly implemented through the resizing function. 1. Right click the data partition and select “Move/Resize” to shrink it. 2. Right click the system partition and select “Move/Resize” to extend it. Then you can extend SBS 2003 server partition without data loss by dragging the handle to the partition size you want on the disk map. For detailed steps, please refer how to repartition Windows Server.